This Orbea Hermanos revolver is modeled after the Smith & Wesson model 1905. This Orbea Hermanos revolver can hold 6 rounds and is chambered for .38 caliber Largo ammunition. Before the turn of the century, Orbea Hermanos was one of the largest pistol manufacturers in the city of Eibar in Spain. During this time, they had just over 400 employees and specialized in the production of revolvers. 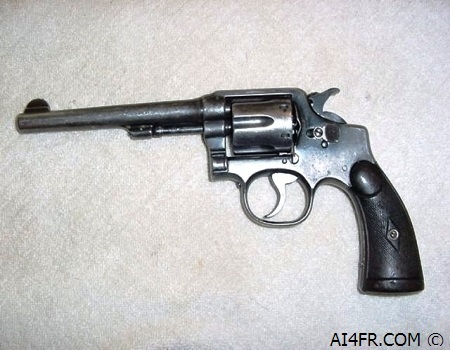 They also produced the Eibar pattern semi-automatic model 1916 for the French army during WWI. After WWI had ended, Orbea Hermanos returned most of their manufacturing effort into the production of revolvers with the major market being the military and police forces of the South American countries. At this time the new smokeless powder cartridges had already been introduced which required that firearms be built with much stronger steel. 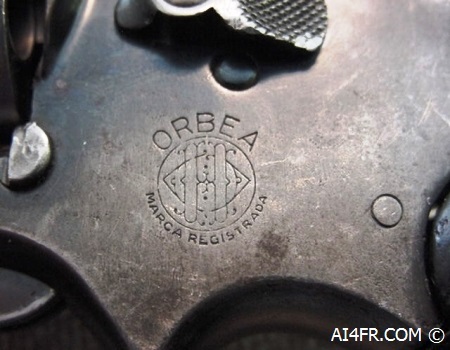 However, the major market for the Orbea Hermanos firm as well as other firearms manufacturers from the Eibar region was a part of the world that still based a major portion of their military and police firearms on the older black powder cartridges. 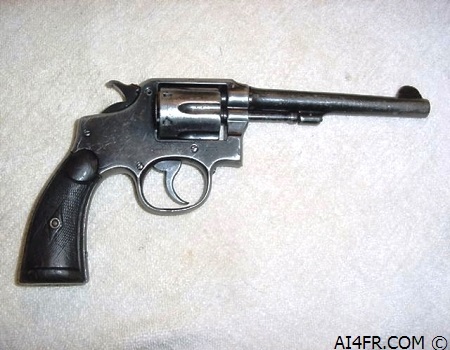 Therefore, Orbea Hermanos was producing these revolvers in the 1920s with a softer steel that could easily accommodate the black powder cartridges. The .38 caliber Largo ammunition is about the same strength as the 9mm Luger. The .38 caliber Largo round usually has a weight of between 123.5 grains to 137.4 grains and travels at a speed of up to 1200 feet per second. While the 9mm Luger round has a weight of around 125 grains and a speed of 1200 feet per second. 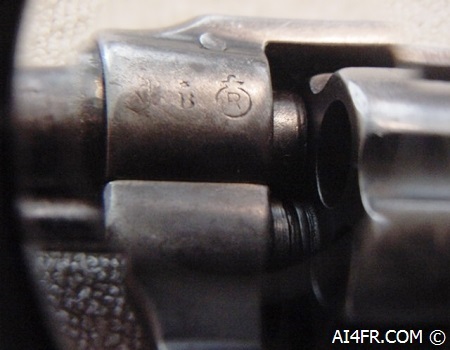 The picture on the left is a close up of the Orbea Hermanos logo that is located on the left side of this revolver. 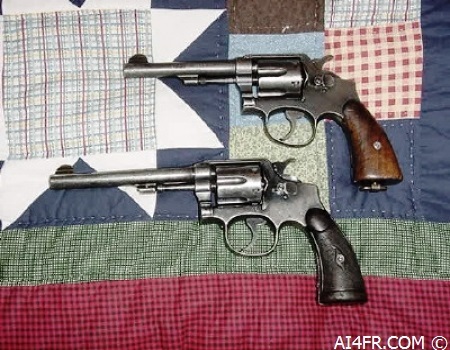 The photograph on the right is a side by side comparison of this Orbea revolver and a S&W Victory model revolver to show how similar they are to each other. On the back strap of this pistol it is marked Policia De La Provincia De Buenos Aires. 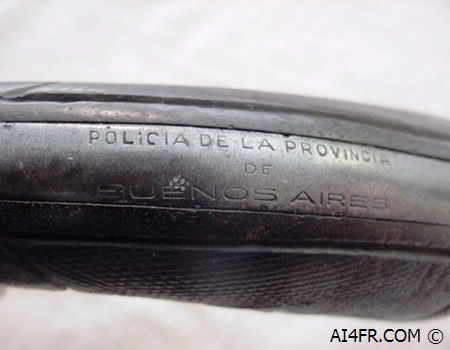 This stamping indicates that this pistol was issued to the police department in the Provence of Buenos Aires which is the capital city of Argentina. The stampings that are on the frame in the picture on the right are proof marks and year of manufacture marks. The first symbol to the left of the letter B is a tad hard to make out in the photograph but it is a knights helmet and shield with the X inside. This is the admission proof mark that appears on Spanish handguns submitted to the official government proof house in Eibar Spain after July 9, 1931. All proofing of handguns in Spain still occurs in the city of Eibar at the Banco oficial de Pruebas(official proofhouse) and the same symbol is still applied to this very day. The "B" stamp with the * on top of it indicates that the pistol was manufactured in 1928. The flaming bomb symbol that is seen just to the right of the letter B was introduced on December 14, 1929 and has the letter P inside the bomb for semi-automatic pistols or the letter R for revolvers. The flaming bomb proof indicated that a semi-automatic pistol was fired and had passed two proof loads, each of which was 30 percent more then the normal maximum operating pressure. This is then followed by two more rounds fired at normal pressure levels to determine whether the self loading mechanism is still functioning properly, if it was, then the stamp was applied to the firearm. For a revolver, where reloading takes place by means of the turning of a cylinder, an over pressure load is used. The letter for the date code with the asterisk on top is still in use as well, and today the letter is followed by a single digit number.